Inside the classroom, the conference room, and beyond, WPI is committed to creating and fostering an inclusive campus community where members of all races, genders, gender identities, religions, or sexual orientation are valued, respected, safe, and empowered. But safety means different things to different people. We all bring distinct experiences, beliefs, and expectations to the university, so having one approach to what it means to have safe space on campus is essential. Safe space is a fluid metaphor that is largely used to describe the learning environment of a classroom, however, it can and has been used to describe any physical space that “allows students to feel secure enough to take risks, honestly express their views, and explore their knowledge, attitudes, and behaviors” (Holley and Steiner, 2005, p. 50) without fear of retribution. As a larger social picture, safe spaces are environments where community members can find a place to openly discuss issues or topics connected to a wide variety of identity related subjects including, but not limited to: the LGBTIA+ community, racism, sexism, social justice, disabilities, religion and spirituality. Our community offers spaces where the needs of those identities are met. We have resources and information on where to navigate a wheelchair on campus, where to find a private area to pray, where to find gender-neutral restrooms on campus (there are several) and where to find designated safe spaces like the OASIS House. Safe spaces are also the individuals that occupy them – the Office of Multicultural Affairs and its dedicated trainers provide education and training to promote the understanding of issues affecting lesbian, gay, bisexual, transgender, transsexual, queer individuals and everyone that falls somewhere along that spectrum. We also have a dedicated nursing room for working mothers/parents/guardians, located in the Gordon Library and The Disability Services Office provides services for students who may need inclusive short or long-term accommodations, including that for testing and the use of assistive technology. The Offering Acceptance, Support, and Inclusion to Students (OASIS) House at 20 Schussler Road offers students a safe and accessible gathering space. The Collegiate Religious Center offers a comfortable and respectful space for those of different faiths to pray or reflect. WPI offers several gender inclusive restrooms across the campus. Access this map to locate one. International House assists and supports international students with questions surrounding employment and immigration of scholars from different areas while also promoting their academic, professional, and personal growth and success. 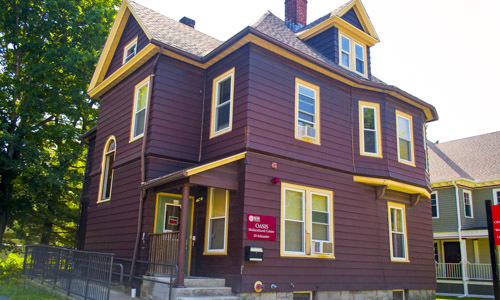 The Office of Disability Services helps students with coordinating any accommodations they may request for documented disability and will advocate for students to make sure they are able to achieve their full potential what at WPI.